Looks like Eric has beaten me to it with his answer, which is more thorough than mine, but I'll explain why the base resistor works anyway. Your code relies on reading the level of a pin set to output. It will only switch off the output if that output is already reading "high". It's unusual, even if perhaps not "wrong", to read the value of an output. I'd use a global or static variable to hold the on/off state, rather than reading it. You need to adjust the value of Rc, the collector current limiting resistor. When replacing the single LED with a strip of N LEDs of the same kind, you have increased N times the current required (that's why you need to use a BJT, because the Arduino I/O pins won't supply that much current). So, you need a new value for that resistor, let's call it Rc', much lower: Rc' = Rc/N. Otherwise, the old value may limit the current far below of what the LEDs need to light up. Rb: a current limiting resistor between D3 and the BJT base. Its value should be in the range 330 - 2200 Ohm. The higher the current draw of the LED strip, the lower the value of Rb should be. Rpd: a pull-down resistor between the BJT base and ground to avoid it floating while D3 is not initialised as OUTPUT. Make it at least 20x the value of Rb. All this should be enough to make it work. 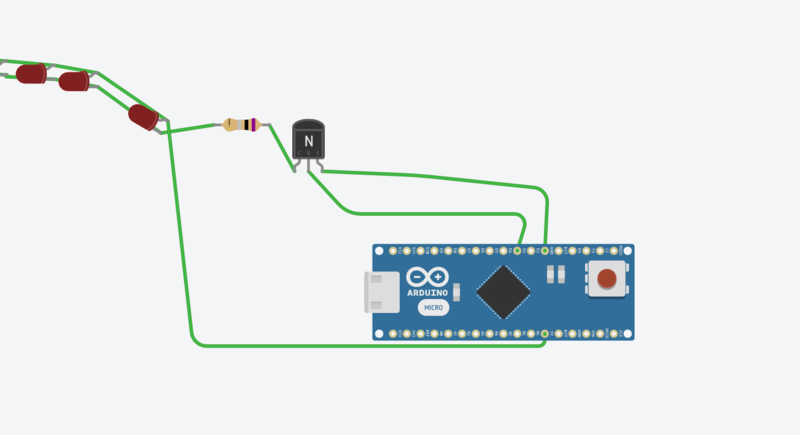 How do I add dimming control to my following LED toggling program on Arduino? Also how do I improve my existing code? Why the LED freezes? when I am adding a delay?